Could This Be The First Annual Ride? 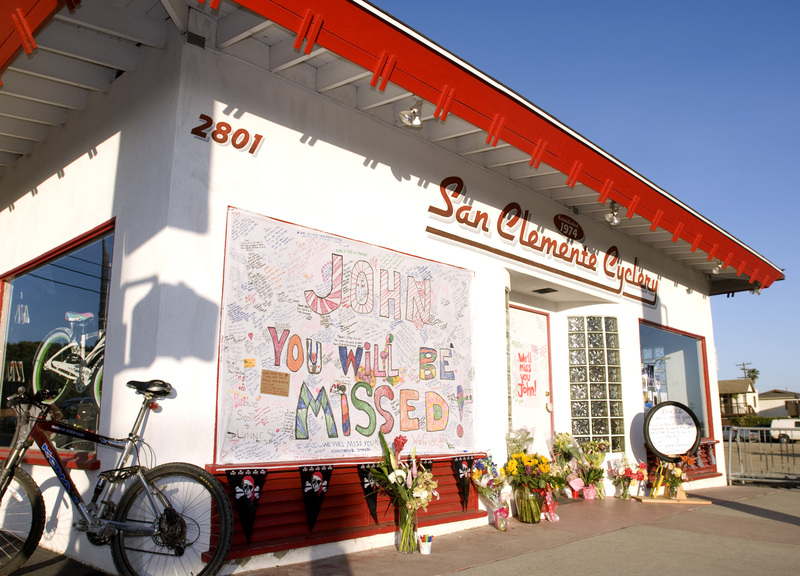 Over the past week I had already seen that several websites, from newspapers to cycling teams and a few industry sites, had highlighted the Sunday morning ride from San Clemente Cycles, in honor of Cuchessi. I knew that there would be a lot of people just because the word of mouth; I went to take some photos and had to keep backing up as people kept coming. Finally I got the best shot of everyone from the roof. Originally, to me, 120 people would have been a lot but then it turned out to be about 350 I would guess. The motivation for the ride was not only to honor Cuchessi but also to talk about his spiritual side that many may not have known he had. The street next to the shop, San Luis Rey, filled up, row by row, of earnest cyclists with a mixed stew of their affiliation to San Clemente Cycles, printed on their jerseys. Bright, volcanic neon colors everywhere, it was hard to focus on any single one thing except the bright shining faces ready to ride. Some announcements were made as everyone quieted down and a few spoke of their weekly prayer and fellowship time with Cuchessi on early Thursday mornings at the shop. It was not easy to hear everything said but there was no doubt about the effect Cuchessi had on everyone that he came across. A few more announcements through a big Cal-Trans road cone (a very low-tech P/A system) and the group moved together for a group photo behind a banner that read “We Love and Miss You John 5.25.08”. I think I was supposed to be in the front for the shot but then ended up on the roof. I could hear my name being called and knew I’d never make it down; everyone was ready to go and anxious. Now I’ll have to find someone to stitch it all together in Photo shop. 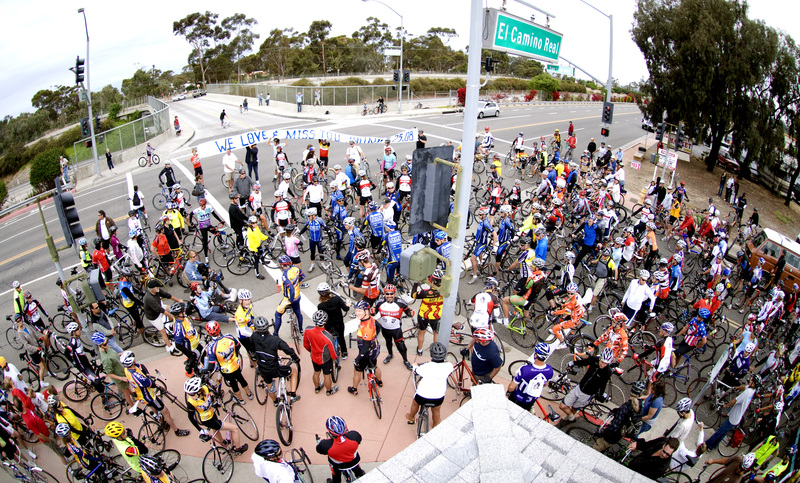 John Cuchessi died on a ride last Sunday(May 18th) on his way back from Camp Pendleton. I got the news through a friend’s text message on my phone as I was working at the shop. I can’t always hear the phone go off with all the tools and so I check the phone here and there throughout the day. I felt something tug when I read it and I thought it wasn’t going to be good. The text didn’t say too much; only that it had been a bike crash. I called and they said he was at Mission Hospital. I can see Mission from my shop and said a little prayer as I looked up over the freeway and through the trees to the top floors and the medi-vac pad on top. I went up to the hospital and he wasn’t there. My feelings that it was not good increased. They gave me the number to Saddleback Memorial and I called. “I’m sorry, how do yo spell the patient’s name?” The Receptionist said through a hail storm of static and background sounds. “J-O-H-N…A…C-U-C-H-E-S-S-I .” I spelled it out as simply as I used to when signing checks in his name at the shop for the UPS deliveries when Cuchessi wasn’t there. She stalled a moment or two and continued. “What is your realtionship to the patient?” She asked. My memory wound back instantly to a long time ago when I first met Cuchessi. How do you get those many memories out of your mouth in the few words she was waiting for? Like some giant fish waiting to be pulled up onto the deck of the boat I jerked as hard as I could to try and get it out in one effort. “Long time friend” I blurted. She stalled again seemingly weighing what I had said. Yes to the transfer and yes to what I already knew would be the worst news. This is a fish I didn’t want to catch and I imagined Sue sitting somewhere in that hospital and gathering up her memories of the man that was her husband and the father of her son. I hung up in the middle of wait. A call into my voice mail confirmed it. A friend had called and I listened to what I already knew. The message went on but there was nothing more to say.